Who knew that the star of so many spaghetti westerns and Dirty Harry movies would one day be producing, directing, and scoring such intriguing, well-acted thrillers such a cut above anything else coming out of Hollywood? That’s exactly what director Clint Eastwood did with this adaptation of the Dennis Lehane novel Mystic River. The story of three men, separated by a childhood trauma, the men are brought together when one’s 19-year-old daughter is found murdered and the killer must be found. Suspicion begins to fall on one of the old friends, Dave Boyle (Tim Robbins), but her father’s (Sean Penn) criminal past and her secret relationship with a neighborhood boy complicates matters. The actors portraying the three childhood friends, Sean Penn as Jimmy Markum, father of the slain girl, Tim Robbins as Dave Boyle, who was abducted as a boy, and Kevin Bacon as Sean Devine, the state policeman investigating the crime, are who carry Mystic River as a film. Each moment onscreen for the three actors, with their different approaches, is infused with a sort of brilliance and Eastwood seems to have stepped aside and let them shine. Sean Penn, who won the Oscar for Best Actor for the role, is riveting as the morally ambiguous ex-con out to find his daughter’s killer before the police do where Tim Robbins, who won for Best Supporting Actor, is more than believable as the wounded soul, molested as a child, who just may be capable of the violent act. 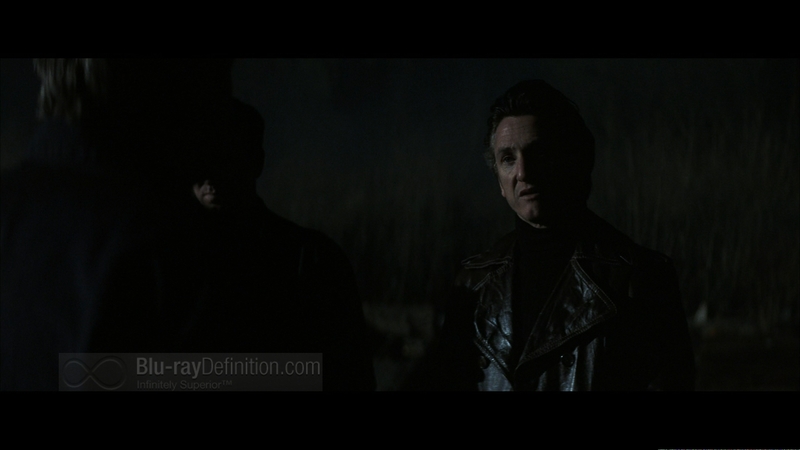 There are parts of Mystic River that aren’t quite perfect, however. Some characters feel tacked on, like Laura Linney as Jimmy Markum’s wife. Not that Linney does a poor job onscreen, it’s that her character is just floating in this drama with no real purpose, until suddenly she becomes a cutthroat, vigilante’s wife, giving sympathy to Jimmy’s darker side. Marcia Gay Harden as Celeste Boyle, Dave’s wife, doesn’t do much more than snivel straight through the film. Her entire character could have been excised and it wouldn’t have been missed. Mystic River walks a thin line between telling a story about broken people and being apologetic towards vigilante justice. It makes for a disturbing emotional drama; the kind that leaves you uneasy and lingers on in your thoughts long after the credits have finished rolling. That kind of film doesn’t come along very often in Hollywood, so kudos to Eastwood. 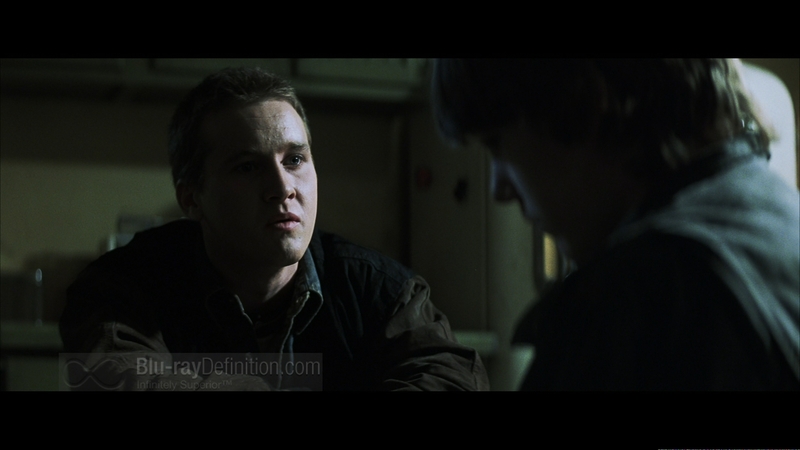 Mystic River’s 2.40:1 framing arrives on Blu-ray in a 1080p/24 VC-1 encoding from Warner Home Video. The film itself has a rather drab, de-saturated, and soft look to it that doesn’t lend itself to looking spectacular in high definition, but film grain is preserved and it retains a very organic, film-like presentation. Where the transfer falters is in black levels that suffer from crush on many occasions throughout the film and whites, which are hot and tend to clip. 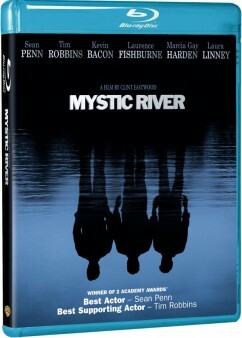 Mystic River arrives as one of the rare titles from Warner that uses the DTS-HD Master Audio format rather than Dolby TrueHD to present the main English 5.1 audio track. The mix for Mystic River is not one that will become a home theatre showpiece, but it is sufficient for the material at hand. The dialogue-driven film does show a little bit of harshness at times in the very dialogue it presents, and there are times when voices could have been just a bit fuller. Ambience is good, however, and there are even a few moments where some discrete sounds are panned from back to front. The subwoofer won’t get much of a workout with this mix, and, frankly, for this sort of film, you wouldn’t want it to. 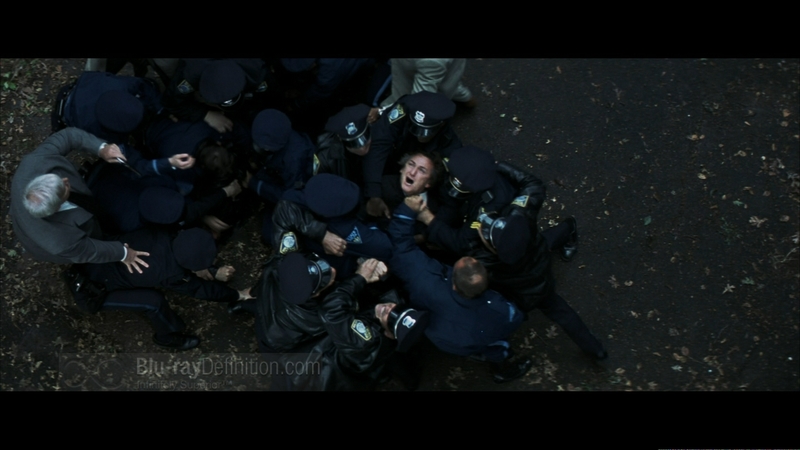 The supplements for Mystic River might not be in high definition, but they are surprisingly interesting. I’d bypass the Bravo TV special and “making of” featurette entitled Beneath the Surface and head straight for the Charlie Rose interviews or the Tim Robbins and Kevin Bacon audio commentary for the good stuff. Mystic River: Beneath the Surface (2.35:1; 480i/60; 0:22.52) — The cast and filmmakers discuss working on the film. Bravo TV Special Mystic River: From Page to Screen (1.33:1; 480i/60; 0:11.32) — In this piece from the Bravo cable network, the story of bringing the story of Mystic River to the screen is discussed by the actors and director Clint Eastwood. Mystic River is one of the stronger films directed by Clint Eastwood. It ranks right up there with Unforgiven. It’s an emotional roller coaster that is superbly acted by all involved, even those with smaller parts. Unfortunately, the video transfer for this Blu-ray release is not one of the strongest I’ve seen, but this film is still highly recommended and the Blu-ray will offer the best looking version of the film available.